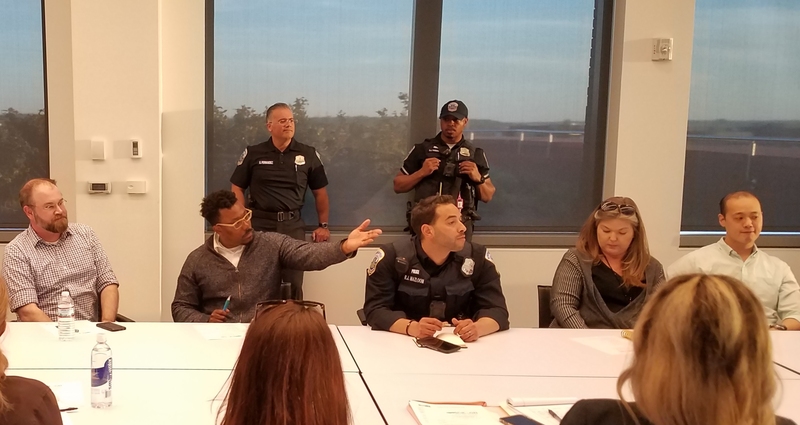 Ken Golding and other representatives of Stanton Development briefed more than 100 community residents – including Councilmember Tommy Wells and ANC6b Commissioners – on the status of the Hine Redevelopment project at Wednesday night’s Special ANC6b meeting. The limp economy has required several changes to the project which will reduce its overall size and appears to reorient it toward the high-end residential market in what has become one of DC’s hottest housing destination markets. If a possible boutique hotel does not materialize, there will be a total of 162 residential units, with a few studio efficiencies of 800 square feet and apartments or condos of 1400-1600 square feet. A variety of options will be provided, including one bedroom, one bedroom with den, two bedrooms, two bedrooms with den, and three bedrooms. The developer promises lots of storage. Since the redesign of the project provides only 12 additional residences over the original plan, yet the increase in residential square footage is 100,000 square feet, it appears that the developer has significantly increased the percentage of apartments with higher square footage. The project will consist of four distinct buildings which step up in height as one moves toward 7th Street from the east, and again steps up as one moves toward Pennsylvania Avenue from the north. A long residential building along the reopened C Street connecting 7th and 8th Streets will anchor the project’s north end, separated from the other three by C Street and a community plaza splayed out, opening toward 7th Street. The structure will contain 33 rental units and below-grade retail. It appeared from developer’s remarks that this building will be reserved for affordable housing for seniors, teachers, and city employees – except for the Shakespeare housing, which Stanton also considers mixed income housing. Stanton “is still working on determining an appropriate mix” of mixed income units for the project. 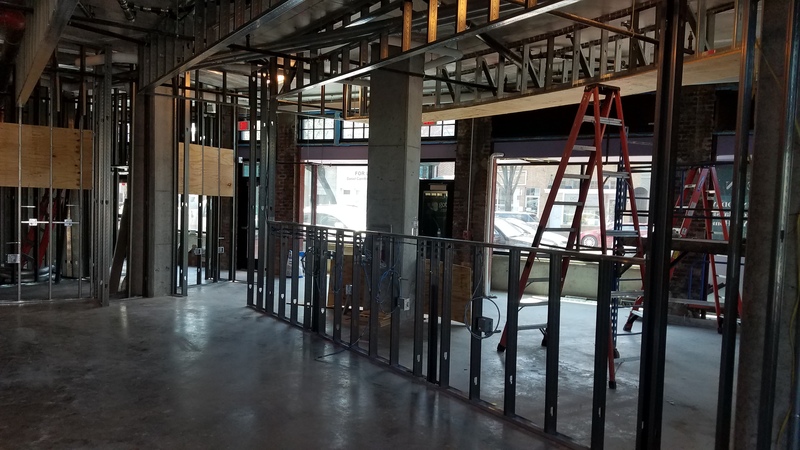 The existing alley between 7th and 8th lies behind this building which will be three full stories tall, with a partial fourth floor set back. The second building, on the NW corner of 7th and C Streets, will be a residential building with 36 units unless it becomes a hotel. Golding said the hotel question will be determined in the next 30 to 60 days. If it remains residential, it will be five stories, with retail on the first floor with four floors of apartments above, rising to a height of 57 feet above the plaza. If it does become a hotel, the total number of residences will drop to 126. A driveway opening onto 7th Street for trucks moving into the completely enclosed truck bay in the center will separate the residential/hotel building from the retail and office building. This building will run along 7th Street and wrap around the corner along Pennsylvania Avenue to a wide entrance to the interior courtyard in the middle of the block between 7th and 8th Streets. There will be retail on the first floor, four floors of offices, and a sixth and seventh floor of offices, the last two with a significant set back. The fourth building will contain 93 residential units and will start on the east side of the entrance to the courtyard on Pennsylvania Avenue, wrap around the Southeast corner of the building and run the length of 8th Street to the intersection of C and 8th Streets. The four ground floor units between the entrance to the center courtyard and 8th Street may have to be marketed as professional office space or “quiet retail,” if they cannot be marketed as residences, but no retail will front onto 8th Street. The Shakespeare studio apartments for temporary residents will be allocated to the north end of this building. There will be four floors of residential and a partial fifth floor which will include mechanical space and seven penthouse units. The building will rise 40 feet to top of the ceiling of the top floor, plus the additional height of any towers or turrets – then the fifth story will rise to a height of 52 feet after a 30 foot set back. Nicole White, traffic consultant from Symmetra Design, discussed site access, traffic, and parking issues. She asserted that improved site accessibility and circulation will be effected by reopening C Street, having cars enter the garage from C Street, and having trucks approach the enclosed loading docks from 7th Street. With respect to traffic, White backed away slightly from a previous statement that there will be minimal impact on traffic. She said instead that the project will not generate a lot of traffic, relatively speaking. Computer models and analysis predict the following number of vehicle trips will be generated by the Hine project. But, White said, this additional traffic will be dispersed in a predictable fashion onto all of the surrounding streets, which in terms of a percentage increase per street appears less significant. She promised to have the percentage increases available at the next Hine status briefing. With respect to parking, she said the project will provide enough parking for itself. One question still outstanding is to what degree the project parking will compensate for the temporary parking the community has become accustomed to on the Hine playground which will be lost once construction starts. White said she would provide this analysis at a later date. Finally, architect Amy Weinstein noted that the buildings are being designed to encourage bike use, with bike storage for the residences and lockers and showers for ride to work bikers. A question and answer period wrapped up the meeting eliciting the following additional bits of information. Detailed drawings for historic preservation purposes will be available by the end of February. The time line anticipates that Stanton will apply to the Zoning Commission next year for a Planned Unit Development. If approved, they will finish the design, get a building permit, close on the property, and begin the two year construction program. A completion date is still anticipated for 2015. In addition, Golding pledged they will come back to the community to talk about plans for demolition. Some 30 neighbors of the Hine Development met with representatives of Stanton Development Tuesday night to receive a status report on the project. Stanton partner Ken Golding announced the project has been scaled back in size and scope owing to the economy. The bottom line is this. Overall cuts in space will result in the project being reduced by about 85,000 square feed – down to 557,374 from 642,336. The Shakespeare Theater has decided to keep its administrative offices in place on 8th Street but will house its visiting performers in the development. The International Relief and Development non-profit will stay in Virginia, though Golding held open the possibility they could become a tenant at some point. The modification of the project will result in some community benefits, including an enlarged community plaza splayed open toward 7th Street, a wider east-west alley between 7th and 8th Streets, and a fully enclosed trash room to ameliorate trash related problems which vex neighbors abutting commercial corridors. Stanton has engaged Symmetra Design as traffic, transportation, and parking consultants. Their analysis is still underway and more information will be available at the next meeting. Information on some related issues emerged during the meeting, including plans for entrance/egress to the garage for cars from C Street and entrance/egress for trucks from 7th Street. Many of the changes seemed to meet with the approval of the neighbors. The most skeptical questions had to do with the impact of traffic and the design features for the 8th Street residential building. 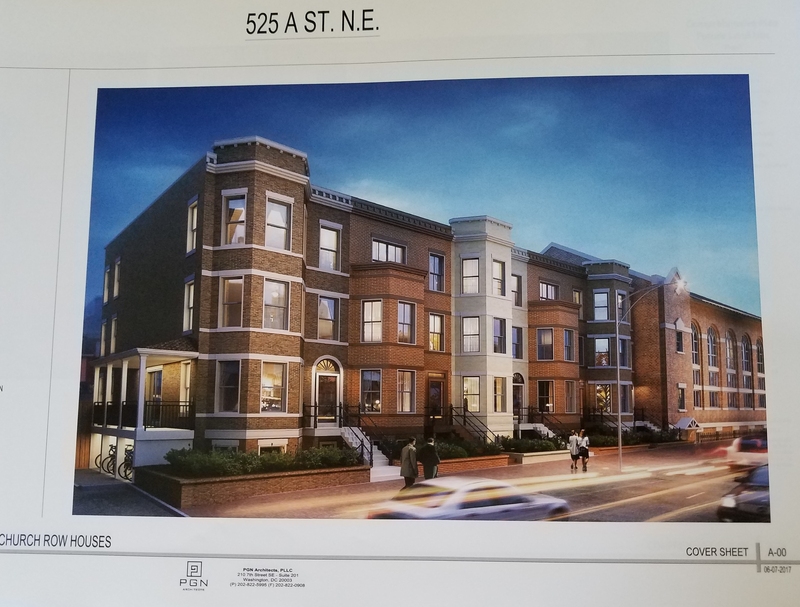 With respect to scheduling, Stanton will submit a plan to the Historic Preservation Review Board in time for a March 24 hearing, and meet with ANC6b before that. Later this year, they will file the Public Unit Development (PUD) and begin the PUD process in 2012. That will be the most important opportunity for residents and community groups to have input on the project. Golding said that the overall time line for the project would be unaffected, anticipating a completion date sometime in 2015. Stanton representatives will update the broader community on Hine at a meeting sponsored by ANC 6B on Wednesday, February 2. The meeting will be from 7:00pm until 9:00pm at Brent School, 301 North Carolina Avenue, SE. Stanton’s plans for the site can be seen at http://hineschool.com/.